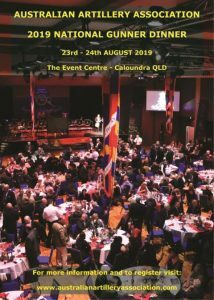 16 AL Regt in conjunction with Australian Air Defence Artillery Association is holding a parade and series of events on May 31 to 2 June 2019 at Woodside Barracks in S.A.
Australian Artillery Association – National Gunner Dinner August 24, 2019 to be held Caloundra on the Sunshine coast. Happy Hour will be Friday 23 August with the main dinner being Saturday 24 August 2019. RAA Assoc (S.A) – is holding their Gunner lunch in conjunction with a visit to the Army Museum of South Australia. 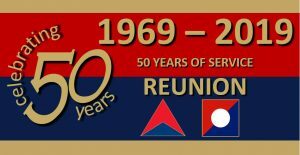 Date: 17 March 2019 – Museum tour commences 10:00am – Venue Army Museum of S.A. Keswick Barracks. RSVP: For more information contact the President President Geoff Laurie – email: laurie.geoff45@gmail.com or mobile 0418 852 661 RSVP by March 11. RAA Assoc (S.A) are holding their AGM on Monday 15th October at Griffins Hotel, Hindmarsh Square East, Adelaide. Timings are: Assemble 1730 hrs, meeting commences at 1800 hrs with dinner served approx 1900hrs. Dinner and refreshments at members own cost. Dress: Neat casual. RSVP: President Geoff Laurie – email: laurie.geoff45@gmail.com or mobile 0418 852 661 Further agenda items to be sent to the Secretary, mobile 0411 446 656 by Wednesday 10th October. RAA Assoc (NSW) are holding their AGM on Sunday 21st October at Parramatta RSL Club, cnr Macquarie & O’Connell streets, commencing 1100 hours. After the AGM there will be a meeting of the new committee to finalise St Barbara’s Day activity. Members and friends can adjourn to the Treetops Cafe Parramatta RSL Bistro and enjoy a light lunch. RAA Association (S.A) Gunner Dinner Thurs 6th September – RSVP’s have closed.